2nd appearance: at end of chapter 2 together with 2 appearances of "Trionfo"
non vano amor com'è 'l publico grido. ché forza altrui il suo bel penser vinse. giuns'e a man destra in terra ferma salse. lassando, se n'andar dritto a Literno. perché prima col ferro al vivo aprilla. e la più casta v'era la più bella. sol per trionfi e per imperi nacque. per spegner ne la mente fiamma insana. non di gente plebeia ma di patrizia. fra gli altri vidi Ippolito e Joseppe. or che fia dunque a rivederla in cielo? In all 6 chapter titles and in the passage at end of chapter 2. Next appearance in chapter 4 at end of part 2 (of 3 parts). Zenobia del suo onor assai più scarsa. fusse al nostro trionfo ricca soma. che fe' il folle amador del capo scemo. che superbia condusse a bestial vita? che fu de l'arti magiche inventore? a l'italiche doglie fiero impiastro? fuggì dinanzi a lor la state e 'l verno? un d'Affrica, un di Spagna, un Lottoringo? che fe' l'impresa santa e' passi giusti. il mal guardato e già negletto nido. che 'l sepolcro di Cristo è in man de' cani! o per arte di pace o di battaglia. era al regno de' Franchi aspro vicino. magnanimo, gentil, constante e largo. then follow some of the triumphs names in red (though not all, Pudicitia is missing, but it appears somehow as the addressed Laura in the final words (though also Laura is not mentioned). I marked in "blue" some other keywords. To live without display, in homely peace. God willing, we shall see in heaven above. One and the other, shall together die. Oblivion, and aspects dark and sad. Immortal beauty and eternal fame. But heaven too desires her, body and soul. My heart still bears the memory thereof. Happy the stone that covers her fair face! What then will it be to see her again in heaven! I see "Laura" addressed in the final lines, but the name doesn't appear in the whole text. I only find a "lauro" in chapter 4-II ... in the middle of Fame. Trionfi and Trionfo don't appear often in the text. Did Petrarca told in letters of his poem and did he call it "I Trionfi"? Is there are a very big collection of his private letters, easy to research? Huck wrote: Trionfi and Trionfo don't appear often in the text. Did Petrarca told in letters of his poem and did he call it "I Trionfi"? Tome 2 and 3 of the Henricus Petri publication of the Opera quae extant omnia contain his letters, perhaps in there. There are other ways to find out, in secondary studies as well. I'll get to it later, if you don't find it in the meantime. We know the poem was "unfinished" at his death, and he never published it as a whole himself. EDIT - sorry, scratch that, crappiest scan I've seen in a while. Thanks for the links, Ross. I look later. Btw, did you note my post about the document of 1457 in the News at Trionfi.com thread? 28 o c. 22 Lire calculation for one deck and not for two? The most expensive Trionfi deck of all? Generally I read, that the Trionfi weren't ready at his death ... Did somebody know and recognize, where the text seems to be unfinished, or is the text "completed by helping hands" ? On the summer night of July 19 in the year 1374 Petrarch died peacefully at Arqua alone in his library. His few remaining manuscripts were dispersed. Some of them may be seen in Rome, Paris, London, or the Vatican. Those which he had given to the Republic of Venice in the "agreement" suffered a strange reverse of fortune. The collection was left neglected for centuries at the Palazzo Molina, Petrarch's past residence. Many of the manuscripts and ancient books had crumbled to powder and others had petrified because of the damp conditions of the storage facilities. Some were even glued into shapeless masses. The antiquary Tomasini found some of Petrarch's books cast aside in a dark room behind the "Horses of Lysippus". The surviving ancient manuscripts were placed in the Libraria Vecchia and are now in Doge's Palace. Many of Petrarch's manuscripts and books found their way to Gian Galeazzo Visconti's personal library in Pavia, later moved to Paris. Many other of Petrarch's books and manuscripts found their way to libraries throughout mainland Europe, as well as the Bodleian Library and the Vatican Library. He decided he wanted to have his valuable collection of manuscripts and ancient books put into a public library on the concept of those of classical antiquity like Ptolemy II of Egypt who built the Library of Alexandria. He called on his Venetian friend Grand Chancellor Benintendi de Ravagnani on this matter. Benintendi enthusiastically took on the idea of receiving Petrarch's books and manuscripts. He immediately prepared the Deliberation for the Great Council meeting in the beginning of September 1362 on this issue. It gave its approval for the donation of Petrarch's books to the church of Saint Mark (Marciana) as the protector of this precious gift, being the symbol of Venice. Likely not much of the Trionfi poem could have fallen in the destiny of Palazzo Molina, cause the project did only run till 1467. It should have been in Arqua ... from there it likely went to the Carrrara. Giangaleazzo is noted to have mch of them ... but the library catalog hadn't so much of hem, I would judge. Giangaleazzo had it likely in 1389, when he had taken Padova for some time. But Vergerius got his big Petrarca interest after Padova had returned to Carrara. So Carrara/Padova should have had a good part. After 1405 Carrara got lost, and Venice took Padova. We've the phenomenon, that Piero de Medici takes in 1441 a Venetian artist, though that should have had its complications. If it would have been the case, that special details only could have gotten in Venice, the operation would make sense. Some calculate, that Matteo de Pasti had a special technique to work with gold, and that this was the reason. But Matteo was young and not very famous then, why should he have been able to do something, which couldn't have been done in Florence. they likely hadn't realized the value in the same manner as the Florentine people did. The üpeople of Florence - with the help of Cusanus - also stole books and manuscripts in Germany. We have then, after Matteo's letter in January 1441, the literary contest in October 1441 in Florence, with a praise or vernacular poetry. The "Trionfi" poem was written in vernacular. 1441 was also "100 years Petrarca as poetus laureatus" ... well, but there were some things before. 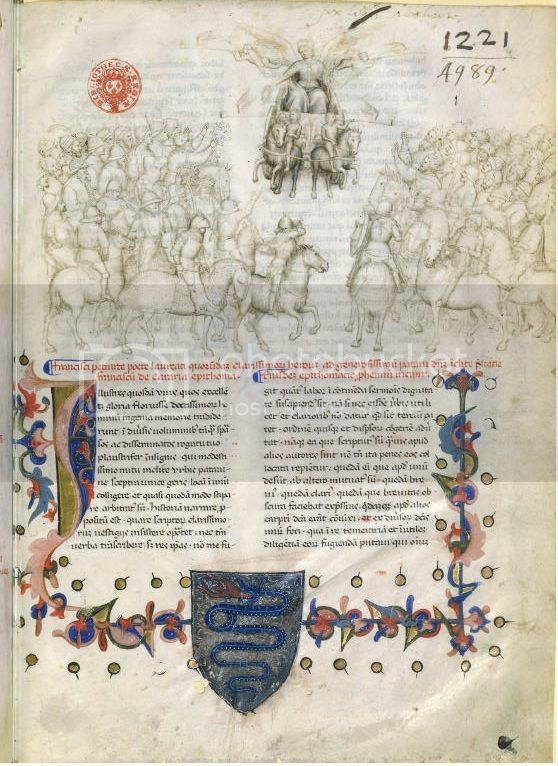 Your March 1439 letter manuscript with Trionfi poem content likely not accidental meets the triumphal processions in Florence in January and February short before. Yesterday I did some more digging. I looked at The humanism of Coluccio Salutati by Berthold L. Ullman. It has a very detailed enumeration of the manuscripts in Salutati's library. The Trionfi wasn't listed, a bit surprising considering that Salutati corresponded with Petrarch. But Petrarch had little contact with Florence during the last 20 years of his life. Writers on the Trionfi as a poem tend to ignore its early history, before 1440. A 1956 Italian edition of the Trionfi, for example, has nothing about how the Trionfi came to be known. I did find two writers commenting on it as a source of illuminations pre-1440. J. B. Trapp, on p. 67 of "Petrarch's Laura: The Portraiture of an Imaginary Beloved" (Journal of the Warburg and Courtauld Institutes, 2001, vol. 64, pp. 55-192) says that the first illuminated manuscript of the Trionfi was in 1414. No source given, no indication of where. Another writer, Margaret Ann Zaho in Imago Triumphalis: The Function and Significance of Triumphal Imagery for Italian Renaissance Rulers repeats this information, with additions: the 1414 manuscript only illustrates Fame [added later: that should be Death], and the first illustrated manuscript of the Trionfi in Florence was 1442. Apparently we are to infer that the 1414 wasn't in Florence. Again, no source for the information. But I would assume that she visually inspected the manuscript. What Huck says about early parts of the Trionfi being sent to friends seems likely. Apparently Ernest Hatch Wilkins has an article in the journal Italica, 1963, arguing that the parts on Love and Chastity were written as a pair. A recent article ("Subjects of Triumph and Literary History: Dido and Petrarch in Petrarch's Africa and Trionfi," by J. Simpson, Journal of medieval and early modern studies 35, no. 3, (2005)): 489-508 finds this idea "plausible" but disagrees as to the date. Simpson thinks c. 1452 is more likely than Wilkins' hypothesized 1428. In the 1450s, Petrarch was no recluse, on numerous missions for the Visconti. I may have exhausted the print resources available in my town; there is no major research library here. I go now to Interlibrary Loan, which will take some time, for an Italian edition (ed. Vinicio Pacca and Laura Paolino), Milan 1996, which might have information in its introduction. The title is Trionfi, Rime Estravaganti, Codice degli Abbozzi. you will see that it was about 20 pages, including one and an unfinished second of the Trionfi, and was kept by Petrarch's son-in-law, as opposed to his main heir Francesco I de Carrara, who got Petrarch's library. If you click on Carrara's name, you are informed that the library was sold to the Visconti. Whether the Trionfi was part of that library is not clear. But the "Codice Abbozzi" wasn't. There is a December 2000 article (also available in GoogleTranslate) at http://archiviostorico.corriere.it/2000 ... 0157.shtml. Laura Paulino is the one who wrote the book being reviewed. According to this article, these codice were Petrarch autographs of vernacular works bunched together. It bounced around Treviso, Padua, and elsewhere in the Veneto at least up to 1501, when Pietro Bembo consulted the autograph--the Trionfi is mentioned specifically; then the codice were returned to their "mysterious owner". Eventually they ended up in the Vatican. Maybe from this lead others will find more information, while I wait for Interlibrary Loan. A book Huck might have access to is Petrarcas 'Trionfi' in Malerei, Dichtung und Festkultur, Weimar 1998, by A. Ortner. But somehow I expect that it won't deal with the period before 1440.
mikeh wrote: Yesterday I did some more digging. I looked at The humanism of Coluccio Salutati by Berthold L. Ullman. It has a very detailed enumeration of the manuscripts in Salutati's library. The Trionfi wasn't listed, a bit surprising considering that Salutati corresponded with Petrarch. But Petrarch had little contact with Florence during the last 20 years of his life. I did find two writers commenting on it as a source of illuminations pre-1440. J. B. Trapp, on p. 67 of "Petrarch's Laura: The Portraiture of an Imaginary Beloved" (Journal of the Warburg and Courtauld Institutes, 2001, vol. 64, pp. 55-192) says that the first illuminated manuscript of the Trionfi was in 1414. No source given, no indication of where. Another writer, Margaret Ann Zaho in Imago Triumphalis: The Function and Significance of Triumphal Imagery for Italian Renaissance Rulers repeats this information, with additions: the 1414 manuscript only illustrates Fame, and the first illustrated manuscript of the Trionfi in Florence was 1442. Apparently we are to infer that the 1414 wasn't in Florence. Again, no source for the information. But I would assume that she visually inspected the manuscript. What Huck says about early parts of the Trionfi being sent to friends seems likely. Apparently Ernest Hatch Wilkins has an article in the journal Italica, 1963, arguing that the parts on Love and Chastity were written as a pair. A recent article ("Subjects of Triumph and Literary History: Dido and Petrarch in Petrarch's Africa and Trionfi," by J. Simpson, Journal of medieval and early modern studies 35, no. 3, (2005)): 489-508 finds this idea "plausible" but disagrees as to the date. Simpson thinks c. 1452 is more likely than Wilkins' hypothesized 1428. In the 1450s, Petarch was no recluse, on numerous missions for the Visconti. Maybe from this lead others will find more information, while I wait for Internlibrary Loan. "Codice degli abbozzi" (The Code of the drafts) is the conventional name with which the Latin Vatican code 3196 is designated, and includes twenty papers (in origin loose, bounded centuries after the death of Petrarch) and containes integrally autographed Petrarchian materials: fifty-seven poems (or portions of them) which converged in the Canzoniere, twelve poems (or parts of them) which were excluded, four poems of other authors addressed to Petrarch, two chapters (one of which uncompleted) of the Triumphs, a fragment of a letter in Latin (Familiares XVI 6). These texts were written in various periods (from 1336 to 1374) and carried out to varying degrees of elaboration: some are actual drafts, others are ready for transcription in final draft. Since they were private papers, they were not included in the legacy of the Petrarchian library left to Francesco I da Carrara and they remained with Francescuolo da Brossano, Petrarch's son-in-law. ... sounds like a realistic description. "Margaret Ann Zaho in Imago Triumphalis: The Function and Significance of Triumphal Imagery for Italian Renaissance Rulers repeats this information ... "
This is interesting for the date 1414, but also the point, that somebody thinks, that a specific edition is from Matteo de' Pasti. In other words: this might be the first, which generally seems to be assumed to be lost. I got it (the version of 1414). You can enlarge the pictures (black/white). There are only 2 pictures. It's said, that it was made in Bologna. Bologna! Good work, Huck. Do you have a link to the page where that's said? The Codices italici (Cod.ital.) 1 to 849 comprise almost 940 volumes from the 15th to the 19th century. They represent a rich source on the history of Italy and particularly the history of papacy from the 16th to the 18th century. The collection encompasses a translation into Italian of De architectura by Virtruv, which was prepared for Raffael and which bears notes and corrections by Raffael himself (Cod.ital. 37) and a Petrarca manuscript of the Frammenti e triomphi written in Bologna in 1414 (Cod.ital. 81). From 1414 in Bologna and now in the Bavarian Staatsbiblliothek ... this sounds, as if this manuscript wandered from pope John XXIII to the council of Constance. Vergerius ? He went to King Sigismund, later emperor. I've found nothing detailed about the manuscript. The Trimph of Fame (1379). Manuscript in the hand of Lombardo Della Seta dedicated to Francesco il Vecchio da Carrara. Paris. BnF fonds latins 6069F, folio. The young cultured Lombardo Della Seta became close friend with Petrarch during his last stay in Padua, from 1368 on. Recipient of three Petrarchian letters and remembered in the testament as legatee of some gifts (a horse and a cup to drink), after the death of the master he accepted his literary inheritance. On behalf of Francesco I da Carrara he concluded the De viris illustribus in the final style wanted by the author. In addition he took care of the papers that Petrarch had left to his son-in-law Francescuolo da Brossano, and therefore published the posthumous Petrarchian incomplete works (Africa, Rerum memorandarum libri, Secretum, Seniles, and Trionfi). End quote. This triumph linked with the chariot as progress of the soul is thought to have been illustrated in a frescos in a salon of the Carraro palace (linking emblematically with the familiy name carrara, chariot). Is the Triumph of Fame/Glory which Seta may have modelled upon Giotto's now lost fresco of the "Triumph of Glory" carried out in Milan for Azzone Visconti in 1335? Giangaleazzo got Petrarca material from Carrara later. Perhaps the Visconti added the viper, also later, when they got the material? 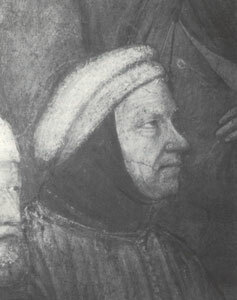 The young cultured Lombardo Della Seta became close friend with Petrarch during his last stay in Padua, from 1368 on. Recipient of three Petrarchian letters and remembered in the testament as legatee of some gifts (a horse and a cup to drink), after the death of the master he accepted his literary inheritance. On behalf of Francesco I da Carrara he concluded the De viris illustribus in the final style wanted by the author. In addition he took care of the papers that Petrarch had left to his son-in-law Francescuolo da Brossano, and therefore published the posthumous Petrarchian incomplete works (Africa, Rerum memorandarum libri, Secretum, Seniles, and Trionfi). I didn't know about this. Where did you find the quote?